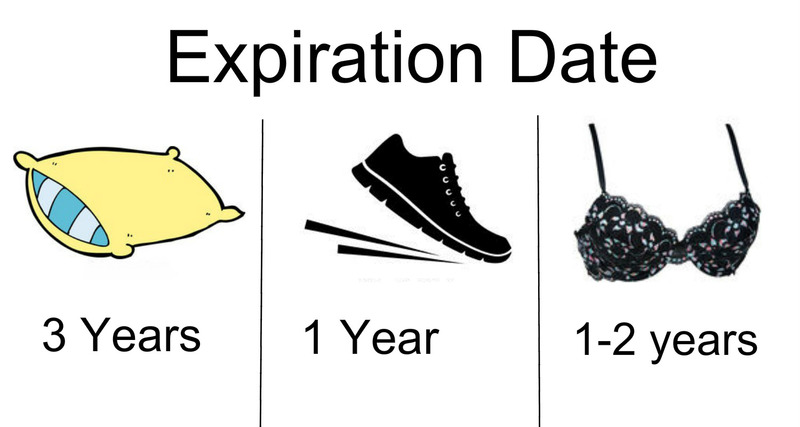 google-site-verification: google8d8438b214143f71.html Beautiful Quotes: 18 Household Items You Never Knew Had Expiration Dates. Nothing lasts forever, and no, we’re not talking about your most recent ex—we’re talking about consumer products you use everyday that you didn’t know weren’t supposed to last forever, like towel, shoes, and even car seats. Here, we’ve listed 18 things you didn’t know have expiration dates. Whoops! Slippers are cozy footwear to change into after a long day in heels and uncomfortable shoes. Unfortunately, they are also a fitting environment for the spreading of fungal infections. Therefore, be sure to wash your slippers as often as possible. Many types can be cleaned easily in the washing machine or by hand. Do you wash and machine dry your towels after every bath and shower? It’s more probable you hang them on a hook to air dry. These damp towels are an optimal environment for bacteria growth. Routinely washing towels after they fermented in their wet state won’t solve the problem. We all know we are supposed to replace our toothbrushes when the bristles begin to wear down. You should also buy a new on after a cold or a bout of flu to prevent you from getting sick again from the germs. Brushes should be cleaned thoroughly once a week and replaced yearly. If you use a hairbrush with natural boar bristle, you should buy a new one every 7 to 10 months. Perfumes with essential oils can last for three years when they are store closed and two years when they are store opened. Eau de toilette are fine for four years when store closed and two years when store opened. The plastic and foam deteriorate over time, losing the shape of the seat until it can no longer protect the child. It’s more ideal to buy a new car seat for your child instead of a secondhand version. Let’s face it: bras don’t last forever. As soon as they begin to bend out of shape, lose its elasticity, feels too big or too small, or becomes uncomfortable overall, it’s time to ditch it and get a new one. Even if you are not a marathon runner or a gym hermit, once your sneaks hit 250-300 miles, their cushioning begins breaking down. This brings unnecessary stress onto your joints. Spices lose their smell and taste over extended periods of time. Ground spices, in particular, should not be kept more than six months. So if you find a large bottle of nutmeg that you never use, it’s a good time to pitch it. First-grade flour can be kept for six months. High-grade flour can be stored for about a year. If you notice any damage to your fire extinguisher, such as cracks in the hose, you should have it corrected as soon as possible. Power strips are usually found at the electrical center of any home, plugging in the toaster, the electric kettle, the iPod charger, the cell phone charger, the tablet charger, the laptop charger, and more chargers. Yet power strips have their limitations. If you exceed the capacity, it can go bad can result in serious problems. After three months of use, disinfectants begin to lose their effectiveness. If you only take out the bug spray for your annual summer camp-out, don’t bother bringing it for the third and fourth year. After two years the repellent becomes useless.